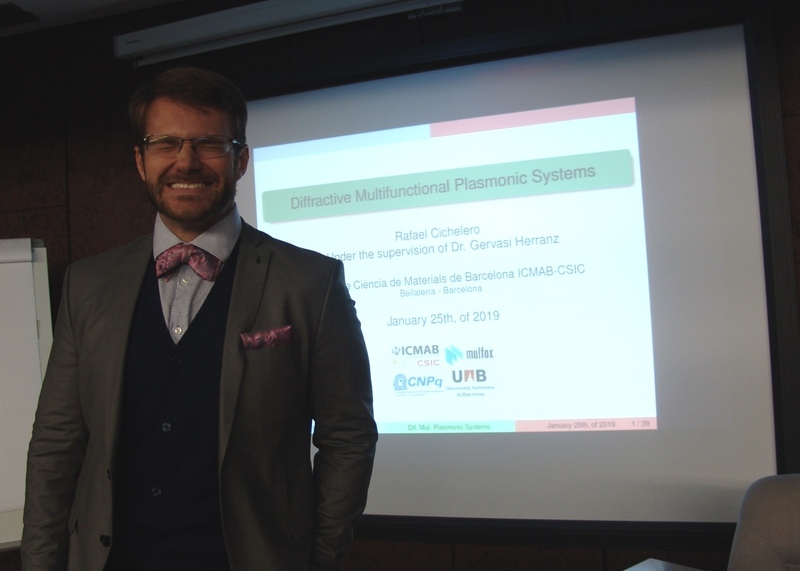 Dr. Rafael Cichelero, former PhD researcher under the supervision of Dr. Gervasi Herranz (MULFOX group at ICMAB), defended his PhD thesis entitled "Diffractive multifunctional plasmonic systems" publicly on 25 January 2019 at the IMB-CNM-CSIC Auditorium. We have interviewed him to know a little bit more about his PhD! 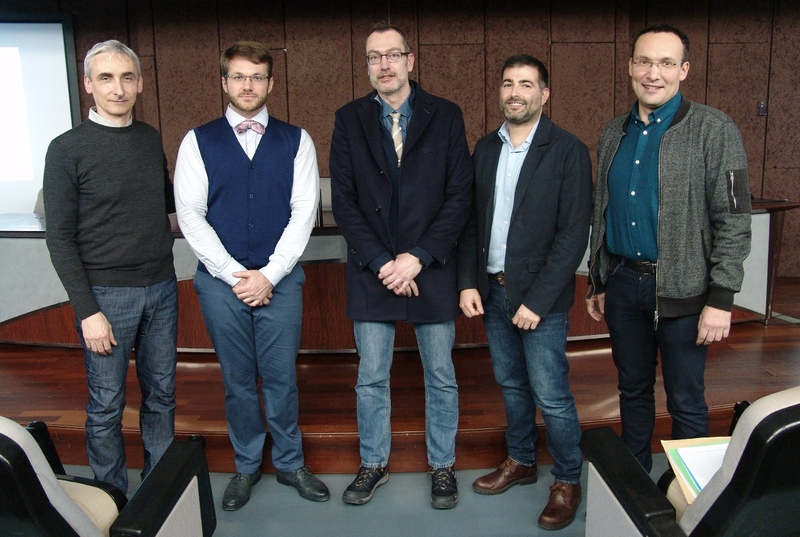 The members of the examining committee were: Paolo Vavassori (CIC nanoGUNE), Agustin Mihi (ICMAB-CSIC) and Vasily Temnov (Institute of Molecules and Materials of Le Mans, CNRS, France). Dr. Rafael Cichelero is from Brazil, where he studied his Bachelor and MSc in Physics at the Universidade Federal do Rio Grande do Sul. Then he came to ICMAB to start his PhD. I came to ICMAB because I wanted to do my PhD with Dr. Gervasi Herranz, an amazing scientist from ICMAB. The interaction between light and matter can happen in many ways. We are used to see each other through reflection. A particular case of our interest consists in the absorption and projection of light into an interface wave, which can be used to transport information through the interface of two materials. What are the main applications of your research? Can you give us an example? Non-reciprocal devices, and sensors, such as optical isolators. From ICMAB, I had the opportunity to meet fantastic people from different places around the world. From Barcelona, the food, CosmoCaixa, Sala Upload, Razzmatazz, Collserola and the cheerful environment. It was an important period of my life, I have learned a lot during my stay at ICMAB. The knowledge that I have built here is the building block of my academic life. Stay in the academia as post-doc. PhD Thesis Abstract: In this thesis we have investigated the modulation of the optical properties of photonic crystals sustaining plasmonic excitations. Such properties can be tuned or enhanced by incorporating functional materials in the crystals, including magnetic, ferroelectric or piezoelectric compounds, which add versatility to the control of light at the nanoscale. Cover Figure: (from left to right): Paolo Vavassori, Rafael Cichelero, Gervasi Herranz, Agustin Mihi and Vasily Temnov.